This week the new Australian Government will sit down again with various society representatives to restart the discussion on emissions policy, with a particular focus on the delivery of a carbon price signal into the economy. These meetings will take place over the next year as a number of policy ideas are considered, but given we are at the start of the process this presents an opportunity to look again at the options. Of course a carbon price is one part of a broader policy framework, which needs to cover a number of very different sectors and also respond to commercial realities such as the development and demonstration of emerging technologies. 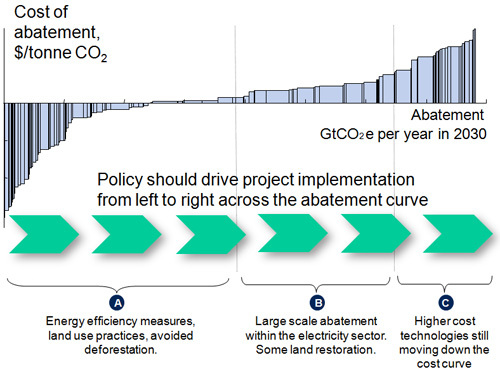 Whatever the result, the policy approach adopted needs to trigger the implementation of emission reduction projects throughout the economy, with the lowest cost result being delivered by doing the most attractive projects first and progressively moving from left to right across the abatement curve. This isn’t the first time Australia has visited the climate policy issue, but it is clear that the subject remains high on the national agenda, not just because of the pressing nature of the underlying problem but also, somewhat ironically, because a number of countries in the region, both trade competitors and customers, are starting to move forward with new policy ideas. Although there is no immediate threat, Australia runs the risk of longer term price exposure simply because of the actions of others. Inaction is therefore not an option. The goal of a carbon price is to create a change in the economy, whereby the market begins to differentiate between goods and services on the basis of their carbon footprint. The carbon price, initially experienced by the emitter or fuel provider (e.g. by paying a tax or purchasing allowances from the government), is passed through to the consumers of the products provided. The result is that the cost of most goods and services will rise, but a new cost ranking will emerge which in turn will change the purchasing patterns of consumers. Products with a high carbon footprint will be less competitive, either forcing their removal from the market or driving the manufacturer to invest in projects to lower the footprint. The extra costs borne by the consumer need to be offset – this would be done by the government recycling the funds its raises from the pricing mechanism back to the consumer through some other mechanism, e.g. a personal tax reduction, a decrease in sales tax / VAT / GST etc..
A cap-and-trade system. This is the approach now operating in the power and industrial sectors in the EU. By design it delivers a specific environmental outcome (through the overall cap) and does so at the lowest overall cost to the economy by driving participants to progressively implement projects from left to right across the abatement curve. Once mature, allowances are typically auctioned by the government into the market with the funds being recycled back to the consumers purchasing the goods and services from the sectors covered by the system. Early on, as the economy begins adjusting to the carbon pricing mechanism, the government may allocate some or all of the allowances for free. A carbon tax. This operates in much the same way as a cap-and-trade approach, although is arguably less efficient in delivering a clear environmental outcome. There is no cap. But it does establish the new capital flow through the economy and does force price differentiation on the basis of relative carbon footprints and market response. The environmental outcome in terms of absolute emissions is uncertain as it depends on the level of production. It is complex to manage as it requires accurate benchmarking across many different sectors. Because of the trade of credits, benchmarks should also represent an equivalent effort when comparing sectors. With credits only issued after a given period of emissions, forward trade becomes very limited. The resulting market lacks liquidity which in turn means poor price discovery. The approach doesn’t set up the same flow through the economy as illustrated above. One reason is that there is no immediate constraint on emissions as production increases, which can mean a weak price signal. There is also no net change in the cost of goods and services, but only a limited redistribution around a mean. It is unlikely that whole sectors will lose market share (e.g. cement against some other building product) as each sector really only competes with its own benchmark. As such, the market plays much less of a role in driving change. A project mechanism. This is operating today in many developing countries as they use the carbon price opportunity delivered through the CDM to start the process of reducing emissions through targeted projects. However, it is not a mechanism to decarbonise the economy on a large scale, with say the national government operating as the credit purchaser. It effectively reverses the capital flow shown above. The government buys from the emitters, which means it must raise taxes to extract this money from the consumer. The consumer might get some of this back through a lower cost of goods and services as efficiency should have increased as a result of the projects but it means that the market does not determine the way forward – rather the government does through its selection of projects to fund. It will also be a major exercise for the government to establish the necessary evaluation boards to assess projects etc. Finally, this approach will result in a somewhat random attack on the abatement curve, rather than the comprehensive and ordered attack that a carbon price, ideally via cap-and-trade, would deliver. 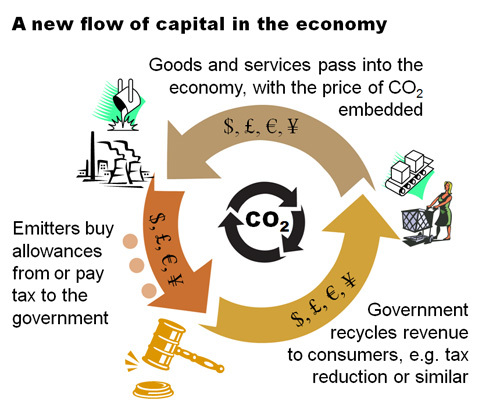 There is also the indirect approach, in other words creating an implicit carbon price within certain sectors of the economy by implementing a regulation of some kind. There is huge scope here, but each regulation will typically target a specific point on the abatement curve, rather than the more ordered left to right approach that delivers a lowest cost outcome. Examples include low carbon fuel standards, efficiency standards, renewable energy requirements, emission performance standards and so on. However, it is well suited to some sectors where a direct response to a carbon price may be limited. A particular disadvantage of this approach is that it is often done in tandem with a direct carbon price mechanism, such as cap-and-trade, for example the renewable energy standard in the EU that operates in the same space as the emissions trading system (ETS). The two are not really compatible in that the renewables requirement results in certain projects to taking place that are further up the carbon abatement curve than would otherwise be the case with the ETS acting on its own. This results in two outcomes – it forces the carbon price to a lower level than it would normally be and it drives up the total cost of the solution for the economy as a whole. In the wake of a deep recession and in the midst of a tough political environment, governments without comprehensive climate policy may well look to a variety of proxy approaches to deliver emission reductions across the economy. These will certainly deliver something, but matching the efficiency and order imposed by establishing a very market responsive approach will be difficult. It will also cost the economy more than is necessary, a difficult route to justify in the current global economic conditions. Value for money in tough times?